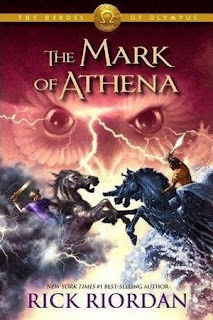 The Mark of Athena is the book where Annabeth finally gets her moment in the spotlight - and it was about time! After knowing and loving the character through seven books, I'd say she's earned it. Told in alternating points of view through four demigods, this installment finds the seven heroes of the new prophecy united and taking their quest to ROME where they face bigger dangers - and more giants - as they work together to stop Gaea. As the middle book in the series, The Mark of Athena was both thrilling and redundant at the same time. Told through Percy, Leo (my favorite boys), Annabeth (!!) and Piper's eyes, I really enjoyed how everyone interacted with each other and again, I found myself impressed by how Riordan tells the story so well throughout the switches in narrators. I loved getting more time with Percy and Leo, because their sass, sarcasm and humor is THE BEST part of this series. I also really appreciated finally being able to get inside Annabeth's head. Frank felt somewhat ignored in this installment which was sad because I grew to like him a lot in The Son of Neptune. Also, I'm hoping we get Jason's POV again eventually because I feel like I barely know the guy and it's hard for me to think of him as equally awesome as Percy when he still seems like a secondary character. I am however, starting to get sick of the fact that every.single.final.villain. in this series has been a Giant. Oh sorry, this time it was TWO giants! Never saw that coming. O.O I get that it's Gaea's army and these are her choice minions but you can only encounter so many giants before it starts to seem...less than fresh. I'm sure our heroes still see the challenge there though, but I couldn't help but wish that there were other baddies to be had at the end there. It's starting to feel repetitive, which was a complaint I'd had with the Percy Jackson Series back when I read it. Also, the installments in this series (still) seem needlessly long compared to the original series. I feel like the could have benefited from being trimmed down some. Despite that, there are in fact other horrifying baddies to be found here (poor Annabeth) and well the various Gods and Goddesses always keep things interesting as well. The villain has been a giant in all 3 books? That definitely takes a little wind out of the final battle's sails since you pretty much know what to expect by that point. Hopefully the House of Hades will see a new villain step up! That ending was SO MEAN. I agree that this series could have been shorter though. For me the last two books were good but idk some of it dragged, plus not enough Percy lol. Great review! SO MEAN! I'm not sure why Riordan made the books so much longer - especially since the PJS became repetitive too but it was much shorter! I think my favorite book in the series is Son of Neptune but we'll see I guess ;) Thanks girl! I hate cliffhangers too even though I get why they use them. Stop keeping us hanging LOL! I haven't read these but when I look at 'em I'm surprised how long some of them are. And yeah I wouldn't want to see the same big bad in 3 books straight... but still, it sounds like these are a lot of fun and worth all the hype! I love Greece too and if I were reading these (or Percy Jackson) I'd want to see some Greek locales too! LOL! Yes, start with the Percy Jackson series :D It's a really fun series though I never fully fell in love with it compared to other favorites. At least all the books are out now so even though the ending is CRUEL, you can jump right into the next one! This bit in the synopsis made me laugh: "but never again does she want to be without Seaweed Brain by her side." XD You'll probably have all of Rick Riordan's books read by the time I get around to Sea of Monsters, but I WILL get caught up eventually, LOL! LOL! Ahhh Seaweed Brain - he's my favorite too XD I really do hope you finish off the PJ series and then read these^^ They're lots of fun! I feel the same about the redundancy in the series. I also was really glad to see Annabeth in the spotlight since she's my favorite character beside Percy. The alternating POVs grate on my nerves a bit because I fall in love with certain characters and then don't get back to them for a while, but I eventually grow to enjoy them all. I haven't made it to House of Hades yet. I can't wait to see what you think! Oh... nasty endings! Why do some authors do that to us?? Sounds like you are hooked to this series! This one was one of the cruelest I've come across!! Yeah, I'm having fun with it anyway but I'm not in love or obsessed or anything LOL! I haven't read any of the books in this series, but I have bought them for my kids... who are not all that interested :( It's frustrating when things go nasty in the end, but the next book is already released, right? I hate it when I have to wait for a full year in cases like that. I can understand that Lexxie^^ these certainly don't hold up to Harry Potter, The Old Kingdom or The Northern Light series but they're entertaining and quite funny! Yes^^ thankfully the entire series is out. I can't imagine the fans that had to wait an entire year before knowing how things played out here! He's really skilled at POV switches for sure! Thanks Omobola!! I was so happy to finally get an Annabeth book! I love her! And her and Percy are just adorable together! Love them! I do find alot of Riordan's books and situations to be repetitive too. I still enjoy them, but I have noticed that. You reminded me that I really need to catch up on this series and the Percy Jackson one! I remember really enjoying them so thank you! I'm a little worried though since you are finding these to be repetitive, but at least I will know what I am getting into when I pick them up again =) Great review too!